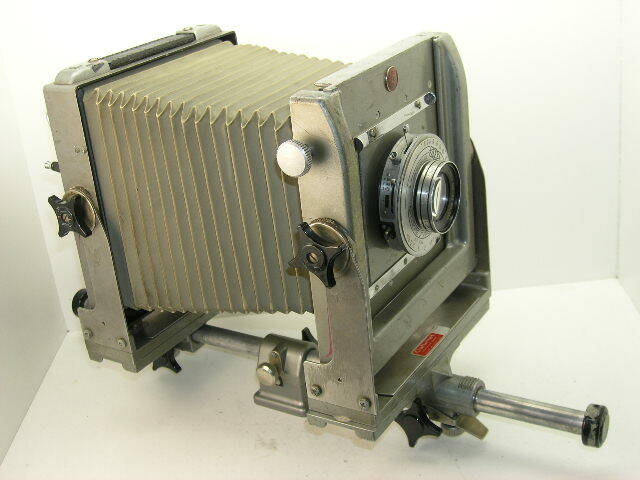 The Calumet CC-400 is a 4x5-inch monorail camera. It was derived from the Kodak Master View Camera. It was the first of a series of similar aluminium-bodied view cameras made by Calumet. The CC-400 is double-extension, with a 20-inch (50 cm) rail, and a 16-inch (40 cm) bellows to suit. Without a lens, the camera weighs 8¼ lb (about 3¾ kg). The CC-401 is triple-extension, with a 26-inch (65 cm) rail and 22-inch (55 cm) bellows, allowing closer focusing and use of longer lenses; it weighs 8¾ lb (just less than 4 kg) The CC-402 is for wide-angle lenses; it has bellows extension up to 73/16 inches (183 mm) and correspondingly short rail. The CC-402 is listed in the 1970 brochure cited, but not in the 1965 one. Other than extension, most features of the three cameras are very similar. The camera is mounted on a solid aluminium rail, round in section with a slot running along the bottom. The mounts for each standard, and the tripod mount, rack along the rail using the black plastic knobs. Each can be locked. The lever on each standard mount releases the racking mechanism, allowing the standards to be pulled freely along the rail when setting up. The chrome-plated knob high on the front standard is for geared front rise/fall, allowing up to three inches of rise, or one of fall. The black knobs on the side of each standard release them to tilt manually, up to 30° forward or back, and similar knobs under each standard release them for shift (up to 7/8 inch (22 mm) left or right) and/or swing (12° each way). At the back, the camera has a ground-glass marked with a red grid, in a spring back; the dark-slide is inserted in front of the focusing screen. The back rotates through 360°, with detents when aligned in landscape or portrait orientation. In addition to standard double dark-slides, a flat roll-film holder was also made (which inserts in front of the screen like the dark-slides), as well as a sheet-film magazine, and a Polaroid back. There is a small bubble level in the mount at each end of the carrying handle on top of the rear standard, one for front/rear and one for left/right levelling. The camera uses four-inch square lensboards. The original Calumet board is aluminium and has a square ridge around the back, which mates with a groove in the front standard to make a light-seal. ↑ 2.0 2.1 2.2 2.3 Calumet view-camera brochure dated Spring 1970, also at Camera Eccentric. ↑ The Calumet lensboard is embossed on the rear with its part number 105822. This page was last edited on 15 February 2017, at 06:34.